The ancient Nubian language continues to thrive in Egypt's Upper Nile Valley, and Egyptians who inhabit the coast of the Red Sea still speak in their native tongue, Beja. Furthermore, Indo-Aryan Domari can be heard daily on the streets of Luxor and in parts of Cairo. 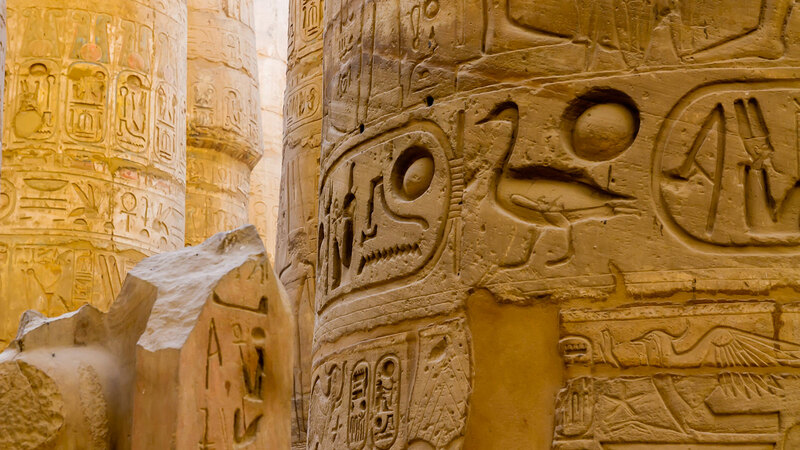 In light of such a densely convoluted history, it is no surprise that these three languages exemplify only a small portion of the many that are spoken across the distinct territories and diverse cultures united by Egypt's borders. Masri, or Egyptian Arabic, is the most popular dialect in the country. However, the only officially recognized language is traditional Arabic: the same vernacular that dominates the entire Middle East and beyond. Bureaucracy aside, the good news is that communication barriers are not a legitimate concern when planning a trip to Egypt. Taxi drivers, waiters, hotel staff, and all other members of the Egyptian hospitality force are sure to speak English well enough to ensure a smooth interaction. Moreover, Egypt tours are available in all languages so there is no need to worry about not being able to soak up every last bit of the stories and knowledge that will be imparted by the guide who administers your tour of Old Town Alexandria or the Giza Pyramids. That being said, as a tourist in general, there is a great deal of merit in making the effort to learn a few key phrases before visiting any place where the native language is not your own. The ability to meet and greet locals the same way they do amongst themselves is a gesture of respect and cordiality that will earn you a genuine welcome and, if you're lucky, authentic friendship. After all, Egyptians spend a great deal of time making themselves understood to us, so why not take a few minutes to learn how to return the favor? On top of serving as a priceless enhancement to an Egypt trip, the knowledge will be very useful in other Arabic-speaking regions you may choose to visit thereafter. blessings, and good will in general. The most popular greeting is is’sallam aleykum (peace be upon you). The normal response is we aleykum es’sallam (and upon you, peace). and, after noon has passed, miss a el kheir (good afternoon/evening). or izzayick? to a female. or ana qwayeesa from a female. or, to a female, ismick eh? or ana mish fahma arabee if you're female. and, for females, lough samahti. or min fadlick if you are female. ...and you just may receive an afwan (welcome) in return. decline the shiny goods that local merchants will fervently try to sell to you. Finally, at some point you will have to say ma’asallama (goodbye). ayna al-Hammaam? - where is the restroom? momkin? - is it possible? momkin shey? - is it possible to have tea? momkin da? - is it possible to have that?